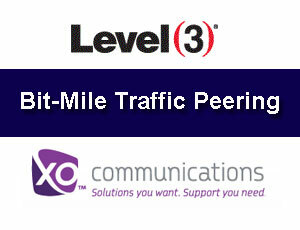 Level 3 Communications and XO Communications announced a long-term, settlement-free, Internet traffic exchange agreement based on a bit-mile balance approach, which measures both the volume of traffic exchanged and the distance over which that traffic is carried by each network. The companies said their new peering agreement is equitable and settlement-free because both networks carry approximately the same bit-miles of data. Both carriers see a balanced cost burden across each network. The peering agreement also contains provisions to add capacity and establish new interconnection locations between the two networks to stay ahead of growing traffic demand. "Level 3's primary focus is on providing quality service for Internet consumers," said Jack Waters, Level 3's chief technology officer. "We look forward to working with our peering partners to drive broader adoption of this bit-mile model to ensure fair and equitable interconnection. We are also working with providers of traffic-flow monitoring systems to make the measurement process straightforward and consistent across the industry." "XO Communications supports equitable settlement-free peering to ensure fair and unconstrained interconnection," said Randy Nicklas, senior vice president and chief technology officer, at XO Communications. "This agreement will ensure a balanced backbone cost burden between our two networks as we continue to grow while providing high-quality service for our respective customers." Qualcomm is now sampling its next generation Snapdragon 800 and 600 processors, which raise the bar on performance per watt in premium mobile and computing devices. The 28nm Qualcomm Snapdragon 800 processors integrate the company's new "Krait" 400 CPU in quad configuration, with speeds of up to 2.3 GHz per core, along with a new "Adreno" 330 GPU delivers more than 2x performance for compute applications over the current Adreno 320 GPU. The 800 processors also integrate a third generation 4G LTE modem with data rates up to 150 Mbps (Category 4) and supporting LTE Advanced Carrier Aggregation. Additional featuring in the 800 solution include world multimode and multi-band support, 802.11ac Wi-Fi, integrated USB 3.0, Bluetooth and FM radios. The Qualcomm Snapdragon 800 processors are capable of 4K UltraHD video (with four times 1080p pixel density) and HD multichannel audio. Smartphones, tablets, digital media adapters, and Smart TVs based on the 800 processor are expected by mid-year 2013. The new Qualcomm Snapdragon 600 processor also targets high-end mobile devices while delivering up to 40 percent better performance than the Qualcomm Snapdragon S4 Pro processors. It features a new Krait 300 quad-core CPU with speeds up to 1.9GHz, a new speed enhanced Adreno 320 GPU and support for LPDDR3 memory. The first phones based on the Qualcomm Snapdragon 600 processor are expected in Q2. “With the overwhelming success of our previous Qualcomm Snapdragon platforms, our mobile processors have emerged as the platform of choice for high-end mobile devices,” said Steve Mollenkopf, president and chief operating officer of Qualcomm. NVIDIA said the performance boost will help deliver more realistic gaming experiences and higher resolution displays. Tegra 4 also enables worldwide 4G LTE voice and data support through an optional chipset, the fifth-generation NVIDIA Icera i500 processor. It delivers four times the processing capability of its predecessor , while being more energy efficient and 40 percent the size of conventional modems. "Tegra 4 provides enormous processing power and efficiency to power smartphones and tablets, gaming devices, auto systems and PCs," said Phil Carmack, senior vice president of the Tegra business at NVIDIA. "Its new capabilities, particularly in the area of computational photography, will help improve a whole range of existing products and lead to the creation of exciting new ones." Intel unveiled a new low-power Atom processor-based platform (formerly "Lexington") aimed at the value smartphone market segment. The company cited design wins with Acer, Lava International and Safaricom. Intel's new value phone platform design features the Atom processor Z2420 with Intel Hyper-Threading Technology running at up to 1.2 GHz, 1080p hardware-accelerated encode/decode, and support for up to two cameras delivering advanced imaging capabilities, including burst mode that allows people to capture seven pictures in less than a second in 5-megapixel quality. The platform also includes the Intel XMM 6265 HSPA+ modem that offers Dual Sim/Dual Standby capability for cost-conscious consumers. Intel is also positioning its Atom Z2580 processor platform (formerly "Clover Trail+") at performance and mainstream smartphones. This platform includes a dual core Atom processor with Intel Hyper-Threading Technology, and also features a dual-core graphics engine. For tablets, Intel is preparing a next-generation 22nm Atom SoC, codenamed "Bay Trail," which is already booting and scheduled to be available for holiday 2013. This device will be the first quad-core Atom SoC, delivering more than two times the computing performance of Intel’s current generation tablet offering. 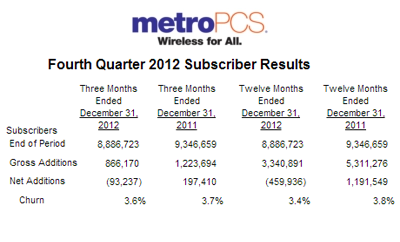 MetroPCS reported gross additions of 866 thousand subscribers for Q4 2012, which represents a 29% decrease over the fourth quarter of 2011. The Company ended the fourth quarter of 2012 with approximately 8.9 million subscribers, which includes net subscriber losses during the quarter of 93 thousand subscribers. The company said it now has over 2.2 million 4G LTE subscribers, an increase of 117% from the third quarter of 2012. Churn for the fourth quarter of 2012 was 3.6% compared to 3.7% in the fourth quarter of 2011 and down from 3.7% in the third quarter of 2012. In October 2012, MetroPCS agreed to merge with T-Mobile USA (a subsidiary of Deutsche Telekom) in a deal that creates a much strengthened No.4 mobile operator in the U.S. market with deeper network coverage and the need for an accelerated path to one common LTE network. Despite operating incompatible legacy networks (CDMA and GSM), the companies said rapid handset turnover (60% - 65% per year) will make for a relatively quick migration of MetroPCS customers to LTE. MetroPCS customers will also benefit from T-Mobile's much more extensive network. AT&T is preparing to launch a wireless-based home security and automation service that will let consumers adjust the thermostat, unlock doors and monitor energy usage via their smartphones or tablets. The wireless monitoring will include cameras, door locks, window/door sensors, smoke and carbon monoxide detectors, glass breakage sensors, moisture detectors and appliance/lighting controls. The service will be supported by dedicated monitoring centers staffed 24/7 with agents able to respond to emergencies and alert police and fire authorities as required. 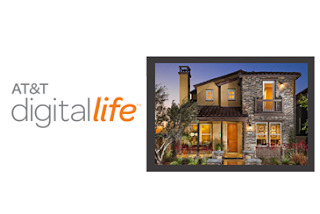 AT&T plans to launch the Digital Life service in eight U.S. markets in March, with up to 50 additional market rollouts planned in 2013. Cisco will provide the Digital Life control panel and back-office provisioning and applications life-cycle management system for the Digital Life service. The home network will use five radios (one-way and two-way communications radios, Z-Wave, Wi-Fi and 3G) to support the sensors, keypads and cameras. Cisco is using the OSGi software framework to streamline new services such as energy management. Procera Networks agreed to acquire Vineyard Networks, a developer of deep packet inspection (DPI) technology for the enterprise market, for $28.0 million CAD, comprised of $15.4 million CAD in Procera common stock and $12.6 million CAD in cash. Vineyard's Network Application Visibility Library (NAVL) is a deep packet inspection ( DPI) that provides real-time, Layer-7 classification of all network application traffic. It provides the application visibility that enables developers of firewalls, unified threat management (UTM) and other network security and management solutions to apply and enforce application admission, control and performance policies for their enterprise and service provider customers. NAVL is delivered as a software developer kit for integration into network infrastructure platforms. Procera said the acquisition will extend its Intelligent Policy Enforcement business into the growing Enterprise DPI market. “Every network element will require intelligence. Our strategic vision is to enable networks of any size to have the intelligence needed to operate effectively. Procera directly addresses this need for service providers of all types through our PacketLogic solutions. 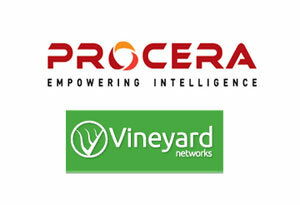 Vineyard enables Procera to expand our total addressable market through their OEM business to include enterprise network equipment vendors, adding the entire enterprise space along with additional opportunities in the service provider OEM market. The addition of Vineyard, which has 34 employees mostly in engineering and product development, establishes Procera as the clear leader in the high-growth DPI market,” stated James Brear, Procera’s President and CEO. Vineyard was founded in 2008 by Jason Richards (CEO), Derek Lownsbrough (CTO/VP R&D) and Josh Zieske (VP Technology Operations). Vineyard is based in Kelowna, British Columbia. In December 2012, Vineyard announced that Xirrus licensed its Network Application Visibility Library (NAVL) for integration with the recently announced Xirrus Application Control platform. In October, Vineyard announced that Riverbed licensed its Network Application Visibility Library (NAVL) deep packet inspection (DPI) engine. F5 Networks has appointed Steve Smith and Sandra Bergeron to its board of directors. Smith is Chief Executive Officer, President, and member of the board of directors of Equinix. Prior to joining Equinix in April 2007, Smith served as Senior Vice President at HP Service. From 2004 until 2012, Bergeron was a venture partner at Trident Capital, Inc. She currently serves on the board of directors of Qualys, a provider of cloud security and compliance solutions; Sophos, a privately held provider of IT security and data protection products; and TraceSecurity, a privately held provider of cloud-based security solutions and IT governance, risk, and compliance management solutions, where she also serves as chairman. Bergeron previously served on the board of directors of TriCipher, a privately held secure access management company acquired by VMware in August 2010 and ArcSight, a publicly traded security and compliance management company acquired by Hewlett-Packard in September 2010. Huawei introduced an Android smartphone with "the largest screen in the world" -- a huge 6.1-inch HD display with a resolution of 1280 x 720. 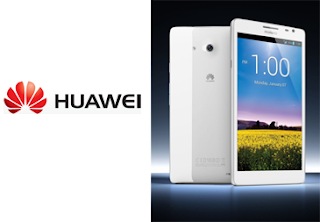 The HUAWEI Ascend Mate features a 1.5 GHz Hi-Silicon quad-core processor and a 4050 mAh battery. Operating on Android 4.1 and featuring an 8.0-megapixel AF rear-facing camera with HDR and 1.0-megapixel HD front-facing camera, HUAWEI Ascend Mate also provides dual MIC noise reduction technology, Dolby sound system and stereo recording. The phone offers five frequency bands and a dual-antenna design that supports high power data transmission and is optimized with maximum ratio combining method, to increase network reception by up to 2.5dB and providing an increase of 20 to 30 percent of overall network coverage. The HUAWEI Ascend Mate will be on sale in China in February 2013. 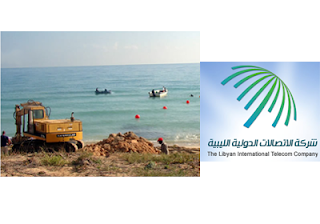 Libyan International Telecom Company, which is the incumbent operator in Libya, has activated the "Silphium" undersea cable system across the Mediterranean. The new cable, which was deployed by Huawei Marine Networks, is one of the longest un-repeatered subsea cable systems in the world. It spans 425km from Darnah in Libya with Chania in Greece. The cable initially carries 10 Gbps wavelengths but can be upgraded for 40G and 100G. LG Electronics has chosen Broadcom's 5G WiFi technology, based on the IEEE 802.11ac standard, for use in select 2013 LG digital TV models. "Last year at CES 2012, Broadcom introduced the industry's first 5G WiFi chips and committed to enabling the adoption of the technology across all wireless product segments," said Dino Bekis, Broadcom Senior Director, Product Marketing, Wireless Connectivity Combo. "Today marks yet another important milestone – the industry's first 5G WiFi Smart TV. 802.11ac. leverages 80 MHz channel bandwidth that is 2 times wider than current 802.11n solutions. Broadcom also uses 256-QAM, modulation to increases data transfer efficiency. Quantenna Communications is showcasing its first dual-band (2.4 GHz and 5 GHz) 4x4 MIMO (four streams) silicon at this week’s International Consumer Electronics Show (CES). Quantenna said its 4x4 MIMO Wi-Fi now delivers unmatched reliability and performance over Wi-Fi in both 2.4 GHz and 5 GHz bands. The 4x4 MIMO chipset is capable of distributing multiple high-definition (HD) video streams to multiple TVs and displays anywhere in the home at full, 1080p resolution. “Service providers’ Holy Grail of coverage, performance and quality for legacy devices is finally realized by Quantenna’s offering a dual-band, 2.4 GHz and 5 GHz Wi-Fi solution,” said Dr. Sam Heidari chief executive officer for Quantenna. In addition, Quantenna Communications and STMicroelectronics introduced a Wi-Fi set-top box reference design platform for multi-room DVR (Digital Video Recorder) services.